Thank you for electing to visit the Voter and Voting Fraud page. Voting is a democratic process that is the very foundation of our Republic. Up until 2008, I used to believe that my Civic duty ended at the ballot box. The presidential election of 2008 alarmed me and turned this political zombie into a political activist over night! It is supremely important to vote but only as long as you are knowledgeable and understand the issues and the candidates. Voter fraud not only nullifies your vote, but can nullify several votes at once, tipping the balance in favor of an unworthy and corrupt opponent. No party is immune. SADLY, VOTER FRAUD HAS BEEN COMMITTED BY THE DEMOCRAT AND REPUBLICAN PARTIES! But it will continue as long as "We the People" allow it by not being vigilant. 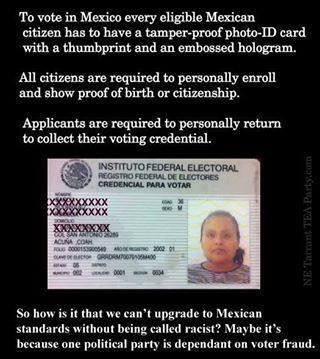 I doubt that voter fraud will ever be completely eradicated, but with the help of Voter ID, it will greatly be reduced. Also consider volunteering to help Election Integrity Project (www.ElectionIntegrityProject.com) and True the Vote (www.TruetheVote.org). But that may not be true. Now the same agencies have acknowledged that there’s only a 38 percent chance that 2014 was the hottest year on record. And even if it was, it was only by two-100ths of a degree. The professors, who provided glimpses of their findings in an article they authored for The Washington Post, said that data from the Cooperative Congressional Election Study indicated more than 14 percent of non-citizens who took part in the CCES survey were registered to vote in 2008 and 2010. 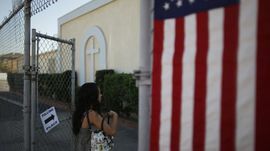 About 6 percent actually voted in 2008, and 2 percent did so in 2010, the professors said they estimated from the data. Texas is the first test by the Justice Department to wring protections from a weaker Voting Rights Act after the U.S. Supreme Court last year gutted the heart of the landmark 1965 civil rights law. A federal judge on Tuesday began reviewing tough new Texas voter ID rules challenged by the Obama administration in a trial that could threaten the polarizing law, although a decision isn't expected before the November election. CHARLOTTE, N.C. (AP) — The struggle for control of the Republican Party is getting an early voter test in North Carolina, where former presidential nominee Mitt Romney and tea party favorite Rand Paul on Monday pushed their own candidates for the right to challenge Democratic Sen. Kay Hagan in November. Heads in Washington exploded Wednesday when a federal court ruled that state-mandated proof-of-citizenship requirements must be included by the Election Assistance Commission in its federal voter registration forms. The woman whose death went unnoticed for six years somehow voted in Michigan's 2010 gubernatorial election. Mummified remains were discovered in the Pontiac home belonging to 49-year-old Pia Farrenkopf last week, when a contractor was dispatched to the property when it went into foreclosure. The remains found in the backseat of a jeep parked in the home's garage have not been positively identified yet, but authorities believe the body belongs to Farrenkopf. Adding more mystery to the gruesome discovery is the fact that Farrenkopf registered to vote in 2006 and even cast a vote in the 2010 elections, though authorities believe she died at some point in 2008. But by 1801, Massachusetts was growing — fast. And the Congress of the Commonwealth decided it needed a system to enforce the restrictions. So they passed a law requiring that officials in each town make a list of residents who met the requirements. If your name wasn’t on the list come election day, you couldn’t vote. It was the nation’s first voter registration law. The announcement comes several weeks after a Los Angeles County jury found Wright, D-Baldwin Hills, guilty of eight counts of voter fraud and perjury stemming from charges that he lied about where he lived when he ran for the state Senate in 2008. The leader of the march, William Barber, II, calls the march the “Moral March” and exhorts followers to engage in a “wave of civil disobedience” against policies and laws passed by the Republican-controlled legislature and a Republican governor. If Barber’s name rings a bell, it’s likely because he was in the news last month for calling Sen. Tim Scott (R-SC), the first black person to serve as a senator from the South since Reconstruction, a “ventriloquist’s dummy”, a derogatory slur hurled at Scott because of his staunch conservative principles (I guess you aren’t a “real” black person, and therefore deserving of respect, unless you are a liberal Democrat). A jury finds that the Democrat lied about his address on voter registration and candidacy papers in 2007 and 2008 and voted fraudulently in five elections. He could get more than eight years in prison. In a purported effort to improve ballot security, a number of states have enacted tough voter ID laws, and amendments to this effect may well arise in the Senate today. Massachusetts senators shouldn’t take the bait. ID rules are a particular burden on elderly, disabled, and poor residents — or anyone else who is unlikely to have a driver's license. The ACLU is distributing postcards to Woonsocket residents residents emphasizing that registered voters who are unable to show a photo id must still be allowed to vote by being offered a provisional ballot at the polling place. Now comes a study from researchers at the University of Massachusetts confirming what was pretty obvious already: The push for tougher ID laws, including the controversial photo ID law that Texas lawmakers passed in 2011, is part of a nationwide strategy on the part of the Republican Party to discourage minority and low-income voting. Never mind that voter impersonation is almost nonexistent. Evelyn E. Burwell's family was surprised to learn she voted in the 2012 general and primary elections. They knew she was an avid voter, but she's been dead since 1997. This bill cried out for a veto from Brown, considering the problems encountered by electronic voting systems during much of the last decade. Comprehensive testing demonstrated that many could be hacked, with the possibility that programming might be inserted so that — for one example — when a voter touched a screen favoring one candidate, the vote actually went into someone else’s column. SPRINGFIELD — Former East Longmeadow Selectman Enrico J. Villamaino III was sentenced Wednesday to one year in the Hampden County Correctional Center in Ludlow for his role in a voter fraud scheme last year. Hampden Superior Court Judge Mary Lou Rup ruled Villamaino must serve only four months, with the remainder of the sentence suspended to be followed by a year probation. Villamaino pleaded guilty Monday to 11 charges related to the voter fraud scheme before last year's statewide primary. Melowese Richardson was sentenced to five years in prison for voter fraud. This all goes back to a lawsuit 31 years ago, in 1981. The following is compiled from an account on The Judicial View, a legal website specializing in court decision research and alerts, and from “Democratic National Committee v Republican National Committee,” Case No. 09-4615. In both municipal and state elections, Smith ran a scheme where he obtained absentee ballots for ineligible voters and in some cases cast ballots for voters without them knowing it. Mexican officials unveiled the voting ID two decades ago to properly identify electors in a country with a history of voters casting multiple ballots and curious vote counts resulting in charges of fraud — most notoriously in 1988 when a computer crash wiped out early results favoring the opposition.